The epicenter of the anti-Israel movement can be found in the UK, where the movement's greatest success was achieved last year when the government issued a recommendation urging businesses to label products that were made in the settlements or the Golan Heights. Furthermore, following Operation Cast Lead, British supermarket giant Tesco added a special extension to their customer service phone line to provide information to callers wishing to boycott Israeli products. The chain reported that the large volume of calls made the phone line crash. The hotline was eliminated a few months after its establishment because of pressure from Jewish organizations. Tesco spokesman David Nieberg told Yedioth Ahronoth this week that the extension was added as result of the numerous inquiries, as part of the company's policy to respect its customers' wishes and political opinions. He apologized on behalf of Tesco for any offense it may have caused. A popular target of UK's boycott movement is Dead Sea cosmetics company Ahava. The reason for their abhorrence of the company? Its headquarters are located in Mitzpe Shalem, which the leaders of the movement consider a "criminal settlement in an occupied territory." Ahava's London flagship storefront, which is located Covent Gardens, one of the city's busiest districts, has turned into the protestors' Saturday hangout; every weekend hordes of people are exposed to the demonstrations that often end with police intervention. More than once, the store suffered damages when the activists threw objects at the window or tried to cause mayhem inside. And it was only this week that a protest was staged at a British university against Mey Eden, a mineral water company that operates in Europe under the Eden Springs label. The movement's efforts have not been successful in stunting sales of Israeli goods in the UK, and no damage was caused to commerce with Israel. The Palestinian lobby for boycott legislation in the British parliament yielded no results so far. The anti-Israel organizations often operate on a lean budget, so in order to make as much noise as possible they resort to using provocative signage, which includes images of bleeding Israeli oranges, tanks bearing logos of Israeli brands, photographs of injured and dead Palestinian children, and slogans the likes of "Israhell" and "Shopping can kill." Naturally, they also use the Internet as a tool to promote their cause, most prominently YouTube. 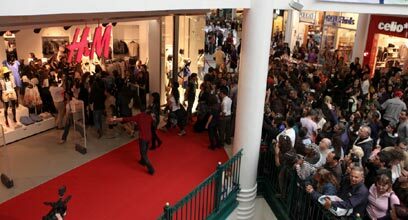 One video clip features a group of activists entering an H&M store in protest of the chain's entrance into the Israeli market. They carry plastic guns and wear camouflage. Another video documents a demonstration staged in front of cosmetics store Sephora in Paris, protesting against its sale of Ahava products. 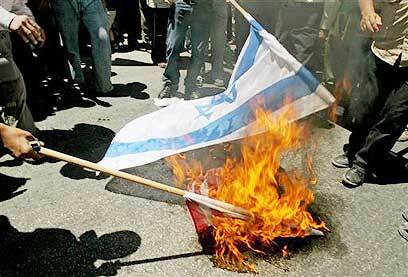 The video calls for a boycott, withdrawal of investments and sanctions against the Jewish state. "Not every YouTube clip with 100 views is a blow to Israel's image," a Foreign Ministry source said. "Most of the shoppers probably treat the group of weird people with contempt, but one of the group members films the activity and uploads it on YouTube. If a local Jewish newspaper writes about the video, they feel like they've done their part." Using this simple measure the groups have been able to extend the reach of their activity without the need to increase their number or budget. The Foreign Ministry official also said some retail chains give in to the protestors' demands. "When we reach out to them and explain that this is just false propaganda, they fix the situation," he said. "Meanwhile, the anti-Israeli organizations present it as a grand achievement, even though the situation was already fixed." Such was the case of Spanish toy store chain Abacus, which announced its decision to replace the Rummikub game with a Chinese knockoff. Anti-Israel organizations proudly displayed the newspaper article that covered the announcement last June, shortly after the events surrounding the Turkish flotilla to Gaza. It was only a day later that Abacus published an announcement denying the content of the article. A chain spokesperson told Yedioth Ahronoth this week that the Chinese version was supposed to be sold as a cheap alternative to the original game; it was not meant to replace it. In May of last year, a local group called the Italian Coalition Against Carmel-Agrexco, published a notice that the Coop and Nordiconad supermarket chains will suspend sales of produce exported by the Israeli company. While the companies did make such an announcement, explaining that it cannot make the distinction between produce from the territories and Israel, it never actually took the goods off its shelves. An Agrexco spokesperson told Yedioth Ahronoth this week that it has been dealing with European chains for over 50 years, and through the positive relationships that it has cultivated no harm was done to its business. However, he did say that there is a need for greater government preparation against such attacks. "The Italians don't like it when the crazy Middle Easterners bring the hatred and extremism into their grocery stores," said one source familiar with the Italian market. "They aren't big Zionists but they don't love the Palestinians too much either. They just want to but their olive oil and mozzarella in the supermarket without a big commotion. The government does not lean towards the leftists organizations, so Israel is not the subject of the stern feelings it gets in other European states." The situation is more worrisome in Germany. Public attitude is reportedly turning against Israel. Over the course of many years the mere mention of the subject made people quite uncomfortable, especially in light of the fact that the first measures that the Nazis implemented to isolate the Jews in the '30s was to boycott their businesses. But a constant stream of negative opinion of Israel has been steadily eroding moral sensibilities. Despite the fact that their attempt to implement a sweeping boycott has generally failed, the anti-Israel activists occasionally do achieve their local goals. In July of 2010, the local government of Villanueva de Duero, Spain banned Eden Springs water from its municipal buildings, due to a campaign lead by the BDS Spain organization. The town of Cigales followed suit the following October. But there are many Israeli companies not willing to take risks. One example is Spicy Way, which markets spices and tea infusions to the UK, and marks "Made in Galilee" on the labels – not mentioning Israel. "We had some uncomfortable incidents when we wrote on the label 'Made in Israel,'" says Karen Pomerantz, one of the two British importers of Spicy Way products. "When we write that the products are made in Galilee, people don't know where Galilee is, and they don't necessarily know that they are made by Israelis." "Galilee is known around the world as a fertile region with a rich history, and the company is trying to make that stand out," a spokesperson for Spicy Way said. "Downplaying Israel on the packages contributes in a certain way to marketing it to a wider consumer base." See all talkbacks "The war on Israeli goods"